NHDOT has 7 New Hampshire Regional Bicycle maps available at the links below for viewing or printing. If you would like printed copies of these maps mailed to you, send an e-mail request with your mailing address to larry.keniston@dot.nh.gov. This page also contains links to other bicycle, rail, and transit related maps of interest. Active and Inactive Railroad CorridorsExcept where a legal public trail exists, do not trespass on active railroad corridors. Violators may be prosecuted. For information about the process to secure a crossing agreement for a State-owned railroad corridor, please contact Lou Barker at 271-2425 or louis.barker@dot.nh.gov. "Abandoned" railroad corridors in New Hampshire generally were never publicly-owned property. Do not trespass on private property. In addition to the "unpaved roads" layer on the Interactive Map, we have created a Google Earth file containing unpaved roads. If you have Google Earth, click on unpaved roads, and the file will open automatically. With the increase in "Gravel Bikes" and the intersest in riding on gravel roads, we have recieved a few recent requests for this file. Please feel free to use this file for reference but there will likely be some discrepancies between the file and what is out on the ground. If you find any errors, please let us know. This Statewide map shows transit provider routes, including intercity bus and rail service locations. Open the map and click on any of the transit provider links for more information. 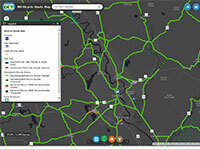 servic locations and Public Transportation in NH. Please contact the Transit Section for more information. 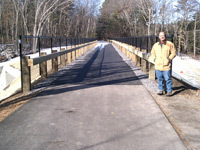 Please let us know if you have New Hampshire bicycle wayfinding tips to share. 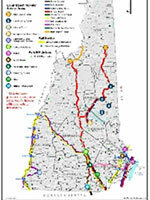 Craig Tufts of the Regional Trails Coordinating Councilhas shared this draft map of the Granite State Rail Trail and local connections. The Southern New Hampshire Planning Commission hosts the RTCC. The purpose of the RTCC includes the advancement of a multi-use transportation trail from Salem to Lebanon. 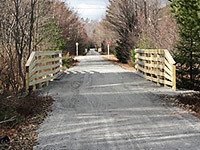 Sample the Derry to Windham portion of the Granite State Rail Trail.